Metro's $1.84 billion operating budget is scheduled to increase less than 1 percent. But ridership is projected to continue to decline, cutting revenues 2 percent. 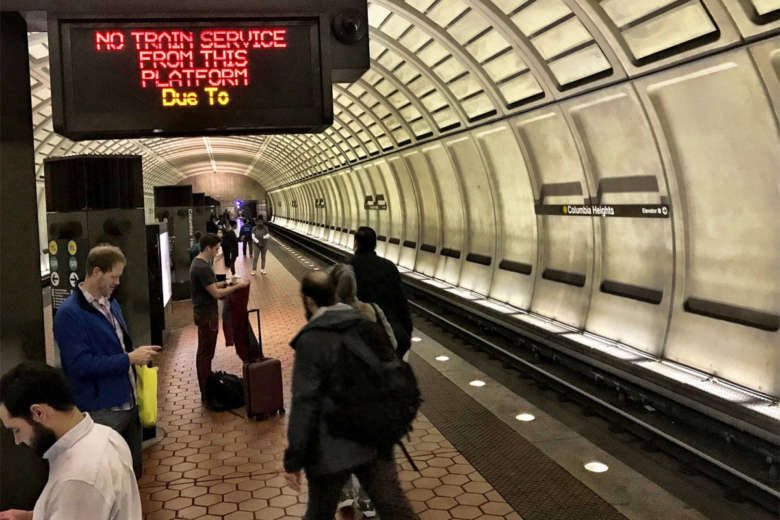 WASHINGTON — Metro riders will not face fare hikes or service cuts this summer under the budget proposal the Metro Board preliminary approved Thursday. But riders will not see any service expansions either. The full board on March 22 is scheduled to approve the plan that maintains the service levels and fares that have been in place since last summer. All the members, sitting as the Finance Committee Thursday morning, supported the plan. The $1.84 billion operating budget is scheduled to increase less than 1 percent compared to the current year’s budget. But ridership is projected to continue to decline, cutting revenues 2 percent. The proposed operating subsidy increase of 3 percent matches a promise made by General Manager Paul Wiedefeld as part of efforts to get dedicated funding for the separate capital budget. “Controlling expenses to grow them less than 1 percent is a remarkable achievement, but until we figure out how to bring revenue on a more upward trajectory — given all the risks that we as an organization face — this is just a very uncomfortable place to be in moving forward,” Arlington County and Metro Board member Christian Dorsey said. The budget does not include any money to cover pay raises that could be required due to ongoing arbitration with Metro’s largest union. That could not only include raises going forward, but could also include back pay since the union’s contract expired. Metro continues to not fully fund pension or other post-employment benefit responsibilities for the future. “There are a lot of things that need to improve, some of which are directly in our control, some of which are not, to really get this on a path where we can feel comfortable,” Dorsey said. The capital budget, which covers infrastructure upgrades and major repairs, rises to $1.28 billion for the year starting July 1, with a total of $8.5 billion in spending planned over the next six years. For budgeting purposes, the plan assumes federal transit formula funding remains steady, but concedes that special annual federal funding for Metro might not be renewed. Given uncertainties, the Metro Board plans to approve another one-year extension of the regional capital funding agreement on March 22, which would allow for the possibility of a full six-year agreement next year as the second phase of the Silver Line to Dulles International Airport prepares to open. Since the capital budget was first proposed last fall, Metro has juggled some of the planned spending to account for a delay in the availability of spare rail car parts, additional progress on cell service and radio upgrades, the current status of water seal tests for tunnels, expanded plans for station platform and parking garage repairs, and replacement of computer servers and other IT systems. While the operating budget does not cut service, it also does not increase it. Maryland Metro Board members decided to grandstand Thursday during a separate committee meeting about potentially ending the “Grosvenor turnback” to send more rush-hour trains to Shady Grove. While the board members were emphatic that a 2015 agreement to pay for critical power upgrades on the Blue and Orange lines included a promise to run all rush-hour trains to Shady Grove starting this year — Michael Goldman even questioned those upgrades Thursday to make a point — they made no effort to add funding for the extension to the full-year budget. Metro plans to solicit public comment on the proposed extension through surveys in April and May, and present options to the board this summer. If the board supports extending service, which could eventually include the need for new turnaround tracks or switches at Shady Grove, the service could start as soon as late December. “In 2015, the service levels were different, ridership was different; the ridership has definitely changed now … it would be a disservice to the board if I just went blindly and just did something that was based on a decision back in 2015. It truly goes against the grain that we set in 2016, which was to look at ridership and to look at what the level of service should be,” Leader said. Running more trains would require adding 11 more train operators above the current budget. While some train operator positions were cut last year, Leader suggested the operators would most likely be newly promoted employees rather than people who had been laid off. Chief Safety Officer Pat Lavin warned that more trains at Shady Grove could make it more difficult for the Red Line to recover from issues during rush hour since there would be less of a buffer. Another major contributing factor to difficulties is the continued lack of automatic train operation across the Metro system. It was turned off after the 2009 Fort Totten crash. “I understand this is a priority for … Maryland to get this, but I do believe that the options are on the table, and I think it’s not realistic to make these changes without having all the information on the table, and I think that’s what’s been proposed here,” Federal Railroad Administration Chief Safety Officer Bob Lauby said. He is the chair of the Metro Board’s Safety and Service Delivery Committee. Maryland has no plans to block the budget approval since the Grosvenor turnback proposal is moving forward. Montgomery County appointee Kathy Porter said adding rail service would benefit the entire region, not just Maryland, since people commute back and forth between Maryland, Virginia and the District. This specific additional service would not address some of the most significant recent cuts: hours of operation or rush-hour service levels at Green and Yellow line stations between Greenbelt and Mount Vernon Square.